Gary Snyder lives in Boston, Massachusetts — but also West Palm Beach, Florida, during the winter months. He says he’s been active his entire life in sports, including varsity baseball, basketball and track during school years. In later years, he became accomplished at tennis and golf. 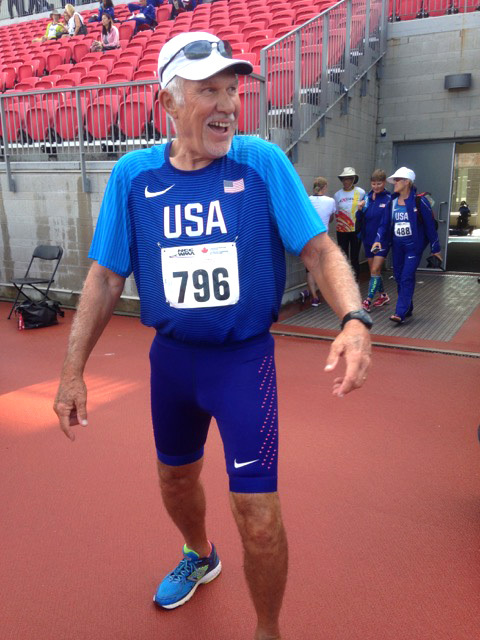 Now a masters sprinter, he has regularly made the finals in USATF national championships in the 60-, 100- and 200-meters dashes. Gary attended Fairleigh Dickinson University and Boston Architectural College and went on to a 43-year career with AT&T and associated companies. “[I] worked my way from a technician to chief financial officer in Massachusetts,” he said. I want to be the athlete’s president. More of a calling than a “want.” For much of my adult life, people have encouraged me to step forward and run for office to represent them. In track & field, this happened on the USATF club administrative level, on the USATF Association officer level, with USATF Masters Track & Field chair and now also with the WMA president position. I am endorsed by the United States T&F National Office and USATF Masters T&F Committee. Establish a council level position to address the needs of country teams. Reduce the athletes expense by revising the schedule. Reduce the price of a ticket for the athlete dinner. I believe I have the background, experience and personality to be president. I’m retired and have the time necessary to fulfill the responsibilities of president. I have emailed my CV and vision statement to many of the past delegates and member leaders. Improvements for athletes is most important and a plan for each member area is the first step. I have some thoughts but need to discuss them with the athletes and hear what they think. Being an athlete, access to track facilities and training are amongst my issues. Bids from all countries should be considered on merit. Masters events at the Olympics are nice but very difficult. There should be events at all IAAF [world] championships. Doping is always a serious issue and the current anti-doping efforts are effective as evidenced by the number of suspensions. I support the current testing program. Additional education may be an option. I believe there is an age at which athletes should not be tested. At a certain age, participation is more important than performance. Standard financial statements should be available on the WMA website. I will travel as needed. I have traveled for my entire AT&T career and for USATF. Travel budgets and expenses are a normal part of standard financial statements. I believe Seto receives support from WMA and therefore is connected to the WMA website. Not sure if athletes want seasonal lists but would find out. The new WMA website is a terrific improvement. I would work with the athletes, council and members to solicit ideas for changes. Very similar to the website response. I’d have to find out what the issues are but direct face-to-face meetings and dialogue are typically the best means to a solution. The issue is: Do we accept records from essentially open events? I believe discussions with IMGA are useful, but WMA is the recognized authority for masters worldwide. Athlete of the Year and similar awards are best selected by a committee of their peers. No monetary awards. The meet is not too large, but the schedule needs revision to reduce the number of days for athlete groups such as sprinters, race walkers, etc. No standards. Should the WMA athletics championships award prize money? If so, how would this be done? No prize money as it would only increase expense. I believe a committee is working on the age-graded factors. Athlete voices are heard through the members. An athlete representative could be added. I don’t know as I am not on Council. What would it mean to be the first American president of WMA? It would be a meaningful culmination of my volunteer career in masters. 3 Comments on "Q&A with America’s Gary Snyder, candidate for WMA president"
UST&F have had serious organisational problems over recent years. In general US sport outlook is very parochial and I don’t feel Gary has had a sufficiently wide experience to be president. In my assessment as former WMA council member (Treasurer and interim’s Executive Vice President) Gary is by far the best suited candidate for the Office of President at WMA. I hope he will succeed. the schedule needs revision to reduce the number of days for athlete groups such as sprinters, race walkers, etc !!! Of course to reduce cost (and not a little..) but also increase level of some events: today, a sprinter has to spend 12 days to run 100 and 4×100..!